Much of the time when the market has had bad days as of late people have pointed to troubles in Greece and Europe as the reason. I decided to isolate the US market a bit to see how much of the selling really could be attributed to Europe’s woes. 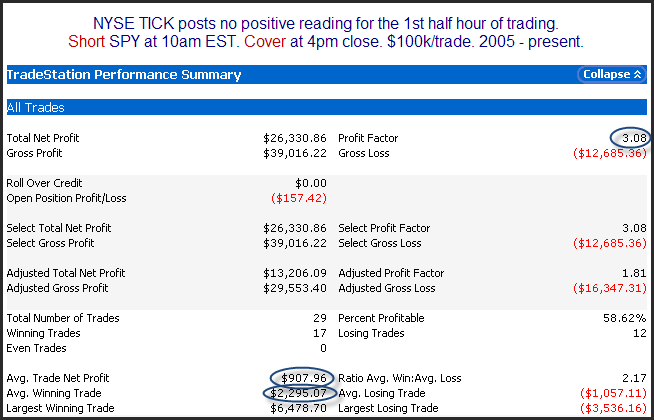 The top pane of the chart shows closing half-hour readings for the SPY from the market top in the middle of January through Thursday’s close. The bottom pane shows an indicator that measures the movement of the US market from the time Europe is all closed at 11:30 EST until the NYSE closes at 4pm EST. As you can see, while SPY is still down around 4% from its January highs, the 11:30 – 4:00 SPY broke out Thursday above the January highs. To me this appears to be a decent though not overwhelming edge that sees a good portion of the bullish tendency play out in the 1st two days. 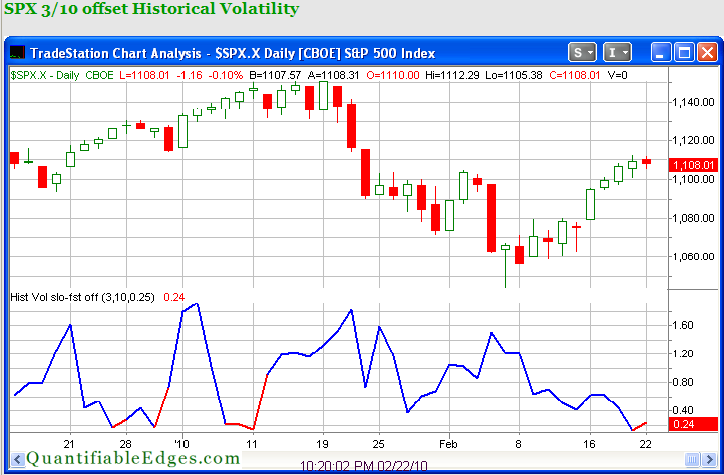 Over the last few days there has been a sharp contraction in volatility. In July I discussed an indicator that looks at the 3-day historical volatility and compares it to the historical volatility of the previous 10 days. When the ratio gets very low (below 0.25 in the study) it suggests a rapid expansion in volatility is likely. I show this indicator each night on the charts page of the members area. I’ve pasted a copy of the chart below. As you can see we have now spent two days in a row below 0.25. I’d expect to see a sharp move occur in the next few days. 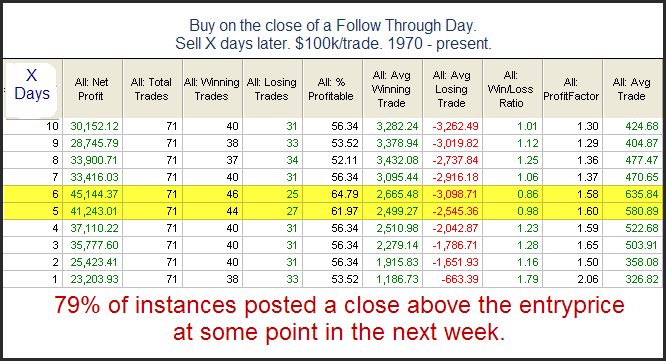 It has now been 5 trading days since the 2/11 classic Follow Through Day (a gain of 1% or more on higher volume). In the February 1, 2008 blog post I examined implications of market action directly after FTD’s. In that post I found this early action to be a strong indication of whether a FTD was likely to succeed or not. 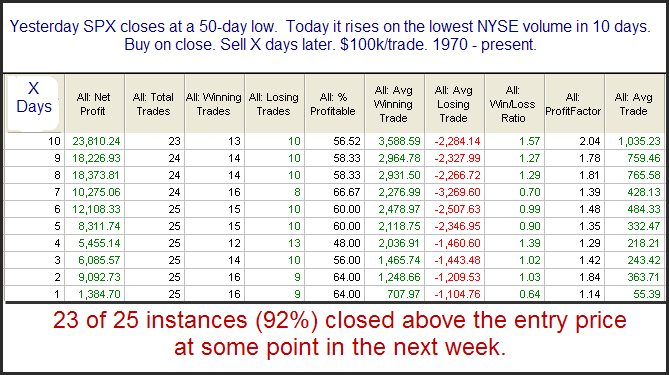 A move higher in the SPX over the 1st 5 days after a FTD led to a successful rally about 2/3 of the time. In the current situation “success” would be a move to 1,147.41 or higher. This is just barely under the January high of 1,150.45. In other words, based on this study, there appears to be a good chance the market will at least test its January highs before it breaks its February lows. One thing to note is that there still has not been a FTD under the current (1.7% gain) IBD definition, so it will be interesting to see what happens here. Tuesday was a 90% Up Volume day on the NYSE. At the same time volume declined from Friday’s levels and was below normal. It’s rare to see volume decline on a day when breadth is so overwhelmingly positive – especially when the market is in a long-term uptrend. Going back to 1970 I was only able to identify 6 other instances. I’ve found many times that extreme breadth will often trump volume. Instances here are too few to draw any solid conclusions, but there is certainly no suggestion that the weak volume spells doom for the rally. Among the links found on that page, traders might be especially interested in the study of short-term implications from Feb 1, 2008. In that post I point out that while intermediate-term traders often view the FTD with bullish optimism, swing traders may see it as a short setup since the market is now “overbought in a downtrend”. We’ve seen many, many times before that overbought doesn’t necessarily mean a downside edge and oversold doesn’t’ necessarily mean an upside edge. This is why two lines are incorporated in the Aggregator and why confirmation is needed with both lines before a position is taken. So below I’ve updated the stats showing SPX performance in the days following a FTD. Results are solidly, though not overwhelmingly, bullish. In any case the edge appears to be to the upside and it is certainly an environment that you typically want to be cautious if trying to short. Two useful breadth statistics that are tracked by Worden Bros. are the % of Stocks Trading Above the 200ma (T2107) and the % of Stocks Trading Above the 40ma (T2108). At the current time the difference between these two readings is very large. 72% of stocks remain above their 200ma, but only 24% stocks are above their 40ma. The only other time since 1986 when Worden Bros. began tracking these statistics that the difference has been this large was late October / early November of 2009. To get such a large difference between the readings you would need to have a strong pullback occur in a strong uptrend. I was curious to see whether such a strong pullback was likely to derail the long-term uptrend and lead to further selling. To get a better sense I lowered the required difference between the two to 40. Below are those results. In general, returns were positive from day 1. From a long-term perspective, such sharp pullbacks have been followed by additional buying. Any uptrend strong enough that such a large number of stocks were trading above their 200ma that the difference could be as large as 40 simply didn’t fall apart when a strong selloff occurred. 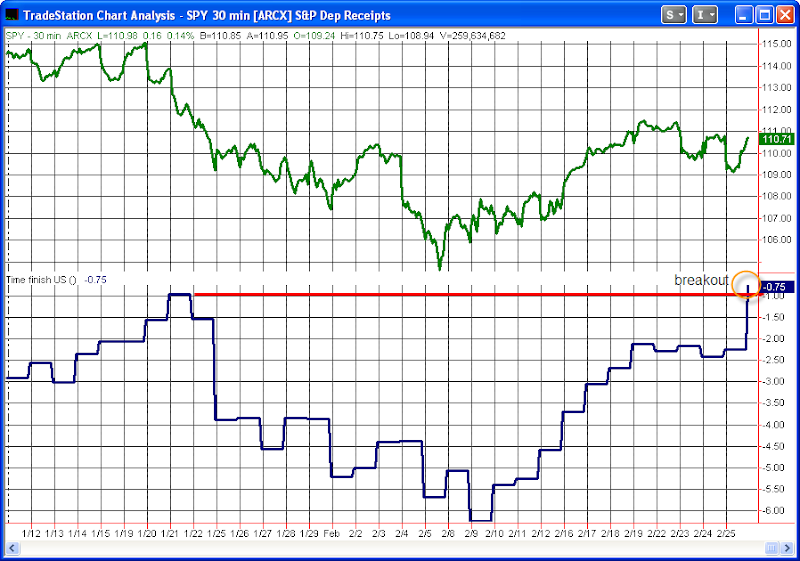 The 2004 instance saw a retest of the highs before the market underwent a lengthy but shallow selloff. The other instances all rallied through their old highs and kept rising. Instances are definitely low but results couldn’t be any more bullish. While we are now way above a difference of 35, I also ran that to get a few more instances. This seems to confirm the previous findings and suggests the current breadth differential is indicative of not a market about to fall apart, but rather a market that is likely to resume its uptrend – or at least test its recent highs. I looked at yesterday’s selloff a number of different ways last night. The overriding theme suggested this selloff is already getting overdone. Below is one example of a study I ran. 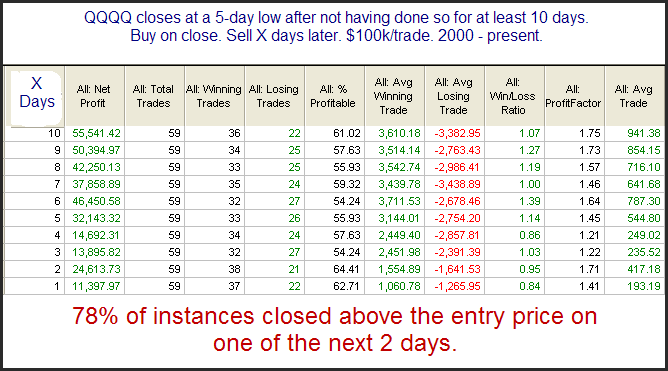 Instances are low, but with 100% winners on days 2, 7, 8, and 9 as well as very strong average trade results over the period I felt it was worth considering. The market is off to a horrible start today. Back in November I looked at days that started off strong and did not register a negative TICK reading for the entire first half-hour. Strong starts often led to strong finishes. Today there were no positive TICK readings for the 1st half-hour. This kind of weakness happens quite rarely. When it has occurred in the past, it’s made for some very rough days. 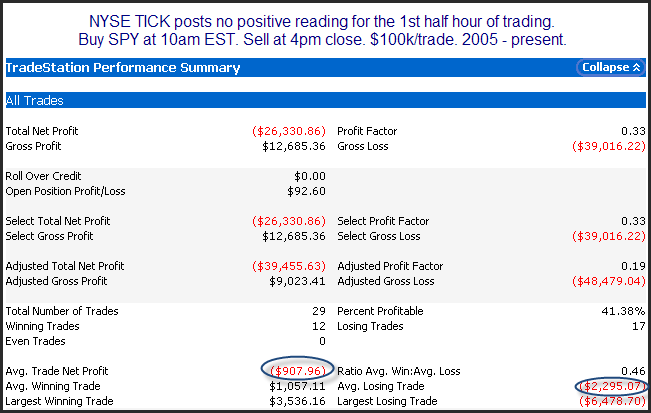 Below are statistics showing the 10am – 4pm EST performance after such weak starts. Certainly not a knife you want to normally try and catch. For those who would rather view it as a short-selling opportunity, here’s how it looks from the short side. No matter how you view it, very weak starts like today tend to carry big risk and little reward for the bulls for the remainder of the day. Yesterday I showed a study that demonstrated how Monday’s low volume at the beginning of the bounce was in fact bullish, and not bearish. This is something that many people have difficulty believing. For the more visually inclined I’ve created a chart below that examines many of the moves up since July. Note that in basically every instance where the market was coming off a strong pullback, technicians could’ve complained about the volume. Volume can be a useful indicator, but it is constantly overvalued and misinterpreted. It’s certainly possible that this bounce could roll right over and substantial downmove could ensue. If it happens it isn’t because of the relatively low volume the last 2 days. How Does Monday's Low Volume Affect The Bounce Chances? NYSE volume came in at the lowest level in over 2 weeks as the market rallied on Monday. Conventional wisdom suggests this low volume is a bad sign and it hurts the chances for a further bounce/rally. I’ve seen many comments in the last 24 hours stating the bounce cannot be trusted because of the low volume. So below is one test I ran examining this theory. I compared these stats to days when volume was not at a 10-day low and they are quite a bit better here. From this standpoint it doesn’t seem the low volume is any kind of a warning sign. In fact it appears this setup provides a bullish edge. Perhaps very weak volume leaves just enough doubters that they end up chasing the market higher over the next several days as they become more convinced. Results here are fairly bullish. This is just one of several studies I am following at the moment. The vast majority are suggesting a short-term upside edge. A word of caution that I’ve been discussing in the subscriber letter is that the market has been acting abnormally for the last 5-6 days. This increases risk and traders must decide how they want to handle it.